The park Quinta de los Molinos is one of these parks that many people from Madrid should know about. Madrid has a great deals of parks and many locals tend to not explore and prefer going to their closest park. 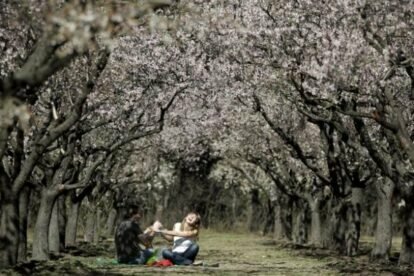 During the year, it’s a great place to go to relax, but this park is specially spectacular during January and February, when the almond trees blossom. The park also has a nice jungle-style lake to complete its idyllic scenery. The almond tree is one of the most beautiful trees when it blossoms. Many people don’t know how they look until they think about Japan. Japan is full of them and famous for it. Madrid offers a similar scenery, this way you don’t need to fly to other side of the world to see these pink flowers. At Quinta de los Molinos you can let yourself relax feeling the breeze and walking through the row of trees. Perfect to relax, have a romantic date or to bring your children. If you go with children, you will find at the end of the park a public “ludoteca” (playroom). It’s a nice effort from the public administration. This place is thought for parents and children. They have a giant place to play and parents have cafeteria with tables just beside it. This way both sides can relax and have fun.